Give your home decor a bolt of energy with this stunning oval mirror. 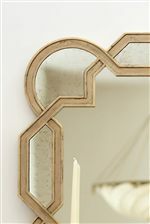 The frame features an eclectic sunburst design, finished in an Antique Gold Leaf color that radiates warmth. Equal parts art and utility, non-beveled glass introduces light and space into any room in the house. Beautifully styled to capture everyone's attention, this oval mirror is the perfect accent to complement larger cornerstone pieces in your home. 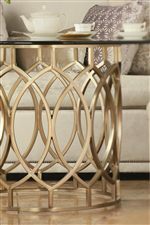 The Salon Sunburst Oval Mirror by Bernhardt at Malouf Furniture Co. in the Foley, Mobile, Fairhope, Daphne, and Gulf Shores, AL area. Product availability may vary. Contact us for the most current availability on this product. The Salon collection is a great option if you are looking for Traditional furniture in the Foley, Mobile, Fairhope, Daphne, and Gulf Shores, AL area.